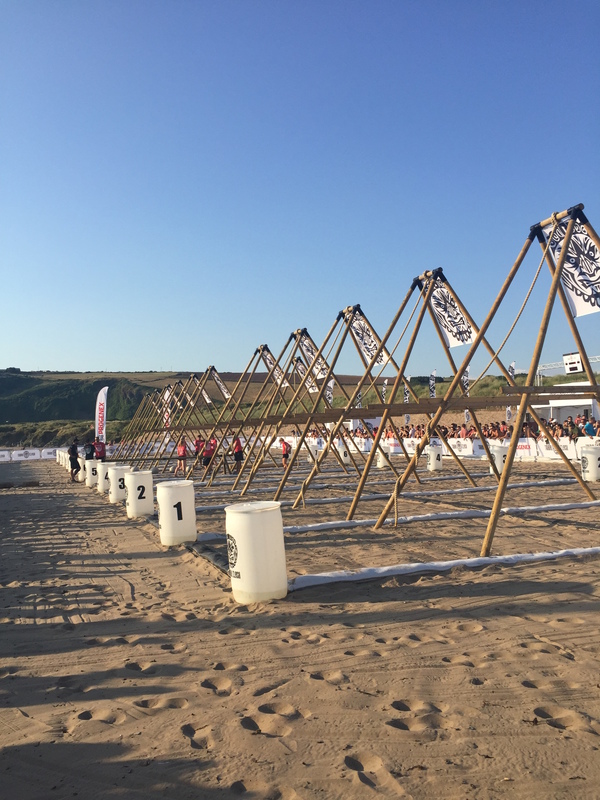 All athletes start behind the run start line on the beach. On GO they run across the beach, over the dunes and towards the rivermouth where they get in the water and swim apprx 600m down the river, with the tide, to the Coronation Boatyard in Bantham village where they exit the river on the slipway. They then proceed through the village, around the golf course and over the cliffs back to the beach, a total of approximately 3km of mixed terrain. The run finishes on the beach in front of staging area 2. Event 2 starts exactly 30 minutes after the start of Event 1. All athletes start chest to floor behind the baseline. On Go 4 athletes proceed to the log, pick it up to Zercher grip and proceed to complete as many squats as possible within the time cap. All athletes must be below parallel at the same time. The team has to have a minimum of 4 athletes back from the run to start Event 2. Only 4 athletes on the log at one time. The team can sub athletes as many times as they like. The team has to swap 2 athletes at at time. Every time the team swaps athletes, the athletes leaving the log must run a lap around the arena before they can return back to the log. The log weighs approximately 70kg. This is a repeat from Portugal 2018. All athletes behind the baseline. The athletes complete this workout in M-F pairs. On Go the first 90 second window opens and the first M-F pair proceeds to complete one Up & Over rep each. 3 points for unassisted, 1 point for assisted. Once both athletes are over the beam, they move to the stones. They pick up the first stones, 42kg (female) and 66kg (male) and complete 3 synchro lifts to shoulder. Each good synchro rep scores 1 point. Once 3 synchro lifts are complete, they proceed to the next stone; 52kg (female) and 77kg (male) and complete 2 synchro lifts to shoulder. Each good synchro rep scores 3 points. Once two reps are complete, they move to the last stone; 66kg (female) and 97kg (male) and complete 1 synchro lift. A good synchro rep scores 5 points. They can then go back to the lightest stones and continue with the reps 3-2-1 and so on. Once the 90 second interval is up, the pair rotates and tags the next M-F pair. Athletes are prone behind the baseline. On Go they complete 6 rope climbs as a buy in, 1 per each athlete. The athletes then proceed to the balance beam, each athlete has to traverse over. Once all athletes are through, the athletes proceed to the worm, clean it to shoulder and lunge the worm 100m down the beach to the marker flag. At 50m mark the team completes 10 synchro burpees over the worm (3 athletes on one side, 3 athletes on the other side, all chest to floor and jump with two feet at the same time). After the burpees have been completed, the team lunges the worm for a further 50m metres to the turnpoint. At the turnpoint the team completes another 10 synchro burpees over the worm. After the burpees are completed, the team lunges the worm back to the arena, stopping at the 50m mark for another 10 synchro burpees. When the worm is back at its starting position the team traverses the balance beam again. The team then completes as many rope climbs as possible in time remaining. One athlete can do as many rope athletes as they want, but when the team swaps the athlete on the rope, they have change male-female-male-female-male-female.